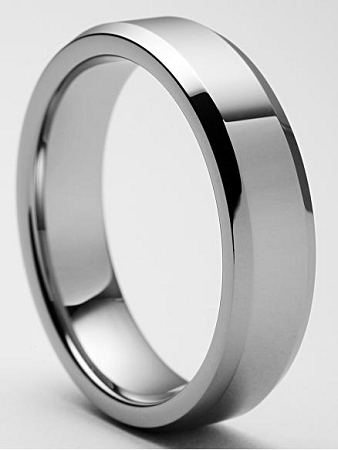 Fantastic simple 7mm highly polished beveled tungsten ring. This Nicollo 7mm beveled tungsten ring also comes in a 4mm, 8mm and 10mm. Q: If I do engraving will it be on the inside or the outside of the ring? Q: Is this ring a continuous circle? It looks like there is a split half way through on each side. This ring not only looks great, it's super durable. I wear it everyday and it hasn't lost its luster and is as sparkling as the first day I took it out of the box! The Tungsten ring is absolutely perfect. I had wanted it for my pinky finger but it was a little too large. (my fault) but I am so impressed by it I'm keeping it as a wedding band. Every product I have purchased from you folks Have met and exceeded expectations. Completely satisfied, ring is just as pictured, looks great, fits great, very comfortable. Customer service is first class. Soon after I ordered the ring I realized I had requested the wrong size, I called and customer service was totally understanding and accommodating. They were able to retrieve my order before it shipped and change the ring size to the correct one thus avoiding the hassle of my having to return it and do an exchange. Nice ring, a bit on the plain side but well worth the price. I'll keep it and probably order another one. The quality of the ring is on point but when I got it it was a little too thick for me so I am going to exchang for the 4mm. I'm really excited to get the 4mm! Bought this ring for my husband as an anniversary gift after being disappointed by another company. The ring is beautiful and looks so good on my husband's finger. Will definitely continue to buy my jewelry at Tungsten. I am very happy with my order.. Very Nice ring I really like it. Very well designed. Although there was a problem with my order it was quickly corrected. My partner like it very much. Thank you Tungsten Ring. I will be sure to order another ring. Love the ring. It is very hard to find a size 16, but you had it. This is a nice ring. I have been wearing it since I received it. Shiny. Bright. Beautiful and comfortable, I just love it! This is my 2nd ring purchased from Tungsten Fashions. The first time I was concerned because the price was so low compared to other options. But I read the reviews and gave it a shot. The quality of the rings are awesome and both times the product arrived early. The rings look exactly like they do in the pictures and don't scratch or wear down. The rings are one of those rare products that are made well, priced fairly, ship on time, and look great. Really good experience and highly recommend. I ordered the ring for my husband. He loves it and it looks really nice. Shipping was super quick. I ordered Monday morning and got it Wednesday when my mail came.